Update: Today (Wednesday) the next wave of HP TouchPads should arrive. 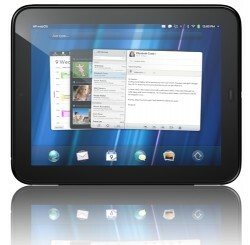 After a run of lackluster sales, HP decided to discontinue its WebOS tablet, the TouchPad. Leaving stores with an unsupported device and a unselling product. At least, that’s what they thought. With stores lowering the price to try to sell the TouchPad, some even going as low as $99, the device sold out. A tablet that no one cared about became popular overnight. What does this mean for the tablet market? It means consumers don’t buy for the potential that the product will be good. They buy for the features it already has. The iPad sold big because of strong third-party support. Also, companies that want to compete with the iPad will have to invest big and wait. Just because a company has a lot of hype behind their tablet, does not mean people will want to fork over hundreds of dollars. It will take time for people to notice the product. Another thing companies will have to pay attention to is when they release a product. Had HP released the TouchPad last year, it would’ve been a top seller based on the hype of it. If HP had released the Touchpad in a time where the tablet market was not over saturated, it would have had a better chance of being sold in higher quantities than what had happened. HP also should have looked for hardware partners to license the software to before they killed off. Now it is unappealing to vendors. While it sold well when the price was reduced, it would mean that to sell, it would have to be very cheap to sell. So if any other companies are planning on getting into the tablet industry, they better strategize more carefully than HP.